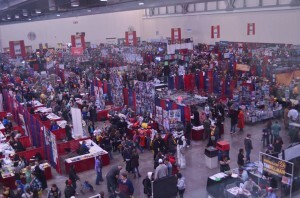 The Grand Rapids Comic-Con features one of the largest vending and exhibition halls in the Midwest! At over 100,000 square feet, one should be able to find all kind of nerdy attractions and treasures displays by vendors from all over the country. CBCS will be Grand Rapids Comic Con to accept comic books to be submitted at our booth. CBCS will also be available to witness your books getting signed at the show, as well as accept books that have already been signed and not witnessed, in which those signatures will be authenticated under our Verified Signature Program. For more information on CBCS please visit their website here. You can also find their Facebook group page here. …And CGC Will Be There Too! Kevin Eastman’s booth will have CGC graders available on November 10 and 11 at his booth. They will be available to witness your comic books getting signed at the show, as well as accept books for grading. For more information on CGC and their system, please visit their website here.